As in many churches, the main entrance to St. Andrew’s is at the west end through the base of the tower. The first space, which we call the porch, is where we display notices relating to the current activities of the church community. On the far side of the porch is a pair of thick glass doors set in a thick glass screen, which helps us to keep the church warm while enabling passers by to observe, and perhaps silently connect with, the worship taking place within. Beyond the glass doors is the main central area of the church – the nave. 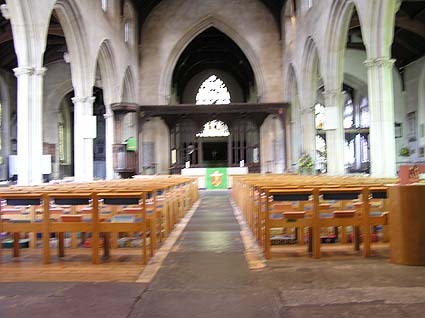 At the west end of the nave, to your immediate right and left, are two carved, canopied churchwardens’ seats, which were installed early in the twentieth century. A churchwarden is one of the main elected representatives of the congregation and is formally responsible for the movable church property and for keeping order in the church. St. Andrew’s Church no longer has any fixed pews in which the congregation sit. The rows of movable seats were installed in the 1970s – a far-sighted decision in those days – and these enable us to use the space much more flexibly. For example, the areas beyond the stone pillars to the left and right of the nave (the north and south aisles) can be used to serve refreshments after services or during concert intervals. Alternatively, for services such as the Christmas Eve carol service which attract large congregations, we can arrange additional seating. At the far end of the nave, just in front of the carved wooden screen is the nave altar, which is on a raised platform. This is where the central act of our worship, the Eucharist (also known as Holy Communion), is celebrated. The rows of seats on each side of the altar platform are occupied by the choir. The nave altar was installed in 1985 to enable us to celebrate the Eucharistic act more centrally among the congregation, rather than remotely at the high altar.